Tyrant, imperialist...it's all the same to me. It’s been more than three years since Ken Blackwell left public office, but his gifts for comedy have not suffered. You may recall Ohio’s former secretary of state as the man who accidentally released the social security numbers of 1.2 million Ohioans in 2006, only to trump his own ineptitude by accidentally releasing 5.7 million more social security numbers the following month. Now the good secretary has graced us with 300 new pages of delicious incoherence: The Blueprint: Obama’s Plan to Subvert the Constitution and Build an Imperial Presidency. The book’s press tour launched with a generously ridiculed appearance on The Daily Show With Jon Stewart. 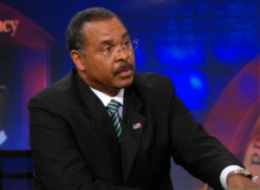 It was followed by a “fact check” making the rounds online, purporting to prove that Blackwell was unfairly attacked by the Comedy Central host. That fact check, of course, was authored by Ken Blackwell. I want to thank the Huffington Post for carrying a piece regarding my appearance on The Daily Show with Jon Stewart, where I discussed the new book that I wrote with constitutional attorney Ken Klukowski, entitled The Blueprint: Obama's Plan to Subvert the Constitution and Build an Imperial Presidency. The falsehoods in that posting, based on the erroneous statements made by Jon Stewart, present an opportunity to set the record straight. First, the piece (and Jon Stewart) says that we label President Obama a tyrant. That's absolutely false. We never once, in the entire book, use the word "tyrant." Beyond that, the only instances where we even use the word "tyrannical" is when we're quoting someone else (and in each instance, that other person is not referring to President Obama). Moreover, we only use the word "dictator" once, and in that instance we were referring to Hugo Chavez, not Barack Obama. So I never tried to make the case that President Obama is creating a tyrannical presidency. Instead, we make the case in The Blueprint that the president is creating an imperial presidency. And he is. President Obama is exercising powers that the Constitution reserves to the other branches of government, or to the states, or the people themselves. Any president — regardless of party — who grabs or exercises powers that the Constitution does not give him is acting as an imperial ruler. The Blueprint was co-authored by Ken Klukowski, an obscure right-wing columnist and senior fellow at a group called the American Civil Rights Union. The senior fellow circuit has also been kind to Blackwell: Since being bounced by voters in 2006, he found employment as a senior fellow at the Family Research Council and the Columbus conservative think tank the Buckeye Institute. That’s where he’s perfecting his theory about how all our tax dollars are funding lesbian abortions.